Watching King of New York for the first time last night, I can't hate this critically maligned Abel Ferrara "disaster" written by Ferrara mainstay Nicholas St. John. Walken is Walken portraying a sort of philanthropic Tony Montana. An infamous, prison fresh druglord looking to partition dirty money into clean causes like a much needed hospital and care for ill children. Larry Fishburne is Walken's street level answerman doing the heavylifting while the late Victor Argo, David Caruso, and Wesley Snipes are the law actively trying to take the operation down. The story moves well enough yet feels scattershot from juggling so many personalities. Argo's silent workman-like calm is always a enjoy to watch. So much so it wouldn't have hurt to slice Fishburne, Caruso, Snipes out completely for more focus on Argo vs. Walken. And as usual, Ferrara imbues the same virulent New York grit felt in Driller Killer and the superior Bad Lieutenant with sometimes uneven punctuations of violence. De Palma's urban crime yardstick Scarface proved the higher one gets in their pursuits; the more gunning enemies are left in the wake. Ferrara's film proves perceptions are hard to shake, especially if you're an underworld kingpin with a pile of bullet-riddled corpses left in your wake...kinda. It would be nice to someday see the alleged two-hour initial cut chopped down to 104 minutes to avoid an X rating. 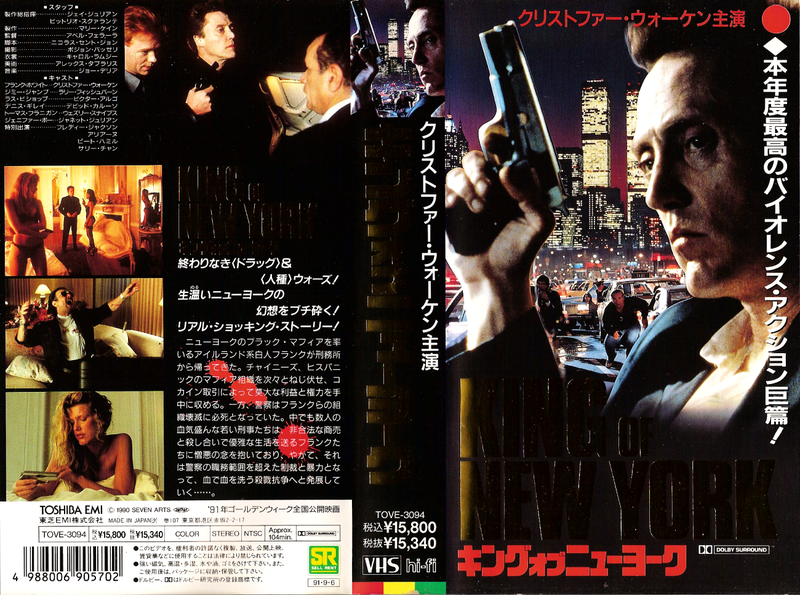 Probably won't make King of New York a classic, but at this point there's nothing to lose. With tapes from Japan, I've found that the picture quality is either excellent or taken from an inferior source compared to other editions (esp. with U.S. productions). Toshiba's King of New York falls in the latter with a very rough 1.66:1 widescreen image. There's a ton of black crush, to the extent African American actors against dark backgrounds look like floating clothing. Crude example I know, but this happens a lot and this VHS definitely isn't the way to see this film. I'll be grabbing the Blu-ray if I feel the urge to see this again.